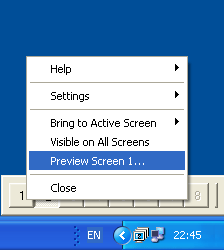 MSEW allows hiding it automatically when mouse goes from its panel, the same behavior as auto-hide behavior of Windows task-bar. MSEW allows keeping its panel always above all running applications. MSEW allows you to configure the number of virtual desktops from 1 up to 10. MSEW allows you to see the whole desktop appearance and applications running on it without switching to this desktop. You can switch the desktop using your keyboard. Press Ctrl+Alt+<X> (default settings), where X is the number of the desktop you want to activate. There is possible to configure which keyboard shortcut to use for switching virtual desktops. You can make the applications from one virtual desktop stay visible on all desktops. You can move a window from another virtual desktop to the active desktop without leaving it. You can move configure MSEW to be transparenced in order to a little hide it from your eyes. You can have absolutely customizable virtual desktops with own wallpaper, screen resolution, screen saver and icons. You can move applications to another virtual desktop using mouse or keyboard shortcut MSEW. 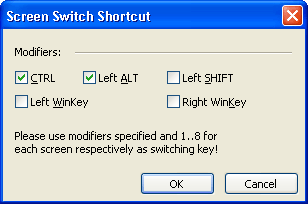 Keyboard shortcut can be configured the same way as shortcut for switching desktops. MSEW allows you to quickly see the list of running applications on virtual desktop and easily switch to any of them. MSEW can be displayed as a panel on Windows Task Bar. You can define custom names such as Games, Documents and so on, for each virtual desktop and it will be displayed on respective button. English, German and Russian languages available. You can add your own language easy and fast. Built-in Update Manager allows to check and install available updates automatically.